HDTV Supply Inc and Automation Connection Inc have teamed up to offer a solution for Homes, Sports Bars and Restaurants that allows an iPad to control and manage dozens of DirecTV™ Receivers and dozens of TVs when coupled with HDTV Supplys low cost WolfPack family of HDMI Matrix Switchers. DTVGameControl from Automation Connection Inc is an iOS turn key application and is perfect for controlling and managing DirecTV Receivers, Video Tiling, Video Walls, even Audio in Sports Bars and Restaurants Their unique user friendly sports guide gives you the ability of putting a single game on to multiple televisions with one tap of a finger. 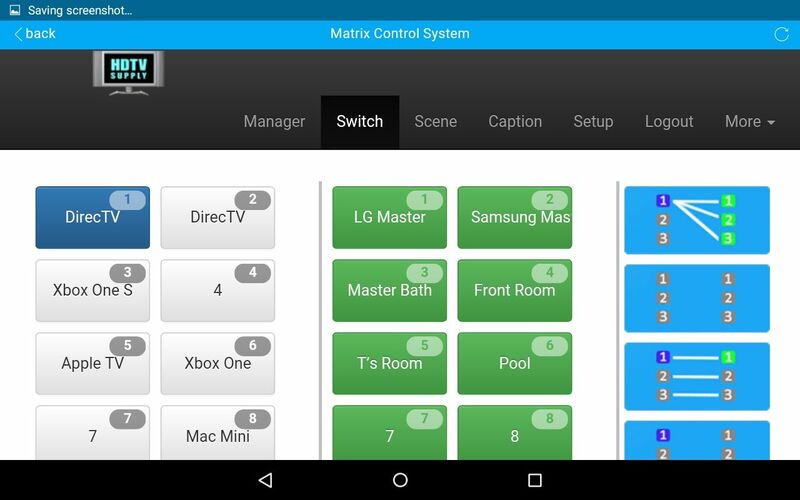 We think it's the best because DTVGameControl paired with our 4K WolfPack 16x32 Matrix Switcher, for example, allows the iPad to become the complete remote control for all of your TVs and it also allows the user to see what is playing on the selected DirecTV receiver in real time, prior to changing the channel. This gives you and your staff the ability to really focus on your customers rather than wasting time scrolling for games. DTVGameControl: Choose from HDTV Supply's WolfPack Matrix, Modulation or Non Matrix (DirecTV receivers strapped to the back of each TV) versions available. Depending on the distribution, our application will accommodate the smallest to the largest of venues. This is a Professional Solution is used for the control and management of DirecTV receivers and Matrix Video Switchers in a commercial environment. A DTVGameControl Preferred Dealer is available for installation and setup, if necessary. DTVGameControl Morning Sequence: This feature will automatically turn on all of your TV's to the desired DirecTV channel and a time each morning of your choosing. SECURE: DTVGameControl is Passcode Protected allowing you to create and control the passcode for all authorized users and staff. No more "well meaning" customers messing with the video! FLOOR PLAN BASED: The application is simple and easy to use because its based on your floor plan. Simple to see what's playing on all of your TV's with easy touch control. No more "which table wants what game?". It's as easy as simply touching the TV on your iPad screen. FIND GAMES FAST: "Game Day" tabs detail sporting events currently playing. Provides quick access throughout the day to ALL daily sports games by zip code and sport themed icons, even program the Favorites tab. Your staff will no longer be embarrassed searching for a game while your customers miss the next Sports Center highlight play. Why not buy this DTV Game Control for our WolfPack Matrix System today? The hardware to control our WolfPack HDMI Modular Matrix Switchers are based around the Global Cache IP2IR-P. The iTach TCP/IP to IR (Infrared Control) With Power Over Ethernet iTach IP2IR seamlessly connects, monitors and controls the matrices via infrared devices over a network and the Internet. The iTach TCP/IP (Ethernet) devices provide a new level of automation and control flexibility, enabling device networking in bars, restaurants, homes, businesses or schools. The product is based on open systems and standards for easy integration and compatibility with iPhone/iPod/iPad control apps, and high-end control systems. Q: What is an approximate cost for implementing the control software only on my WolfPack 12x32 HDMI Matrix Switch? ...and we have created this simple and very easy to use software. If you are an end user and want to have a control system from any of the above 3rd party control houses but your budget can't support the price you were quoted just call us for a quote as it will be $1,000s less others have quoted. Stop Hunting: Our guide service - Saves time and Stops the embarrassment of searching for customers games. DTVGameControl provides staff with quick access to ALL sports games daily by zip code, detailing sporting events and their channels throughout the day. ROI: Return on Investment, the low recurring cost of DTVGameControl will add up to a conventional control systems cost in 4-6 years. Morning Timers: Automatically turns your TVs on to your preset channels and settings of your WolfPack matrix system. Future Proof: It will be the last control system you will need and the matrix system can be expanded or upgraded. 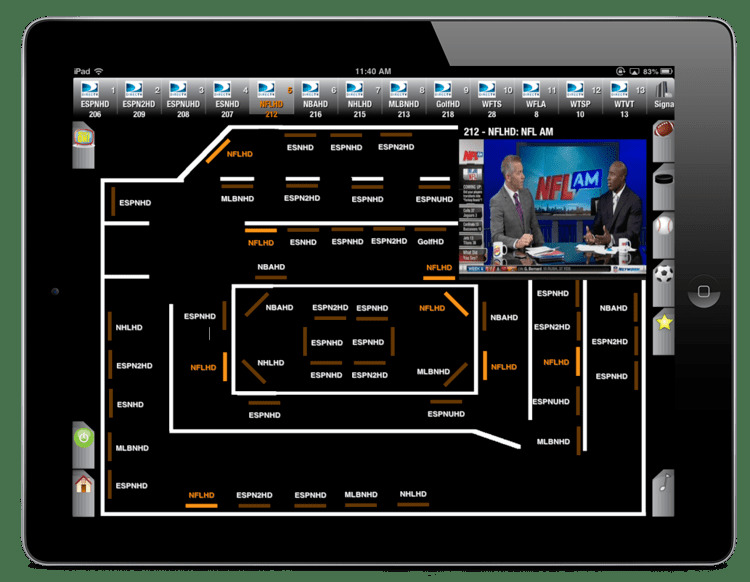 Easy to Use: Minimal staff training as it is a TV floor plan based. The convenience of everything being on one iPad screen allows as fast as you can touch the screen your TV channels will change. Game Day tabs: All the games that are being played that day are at your fingertips. One Touch Solution: Will let your staff focus of the customers and customers needs, not the switching of the games!